If you've been a gamer for, oh say 20 years, then Earthworm Jim is probably no stranger to you. It is truly one of the most enjoyable game yours truly has ever played. Earthworm Jim is not your regular platformer. 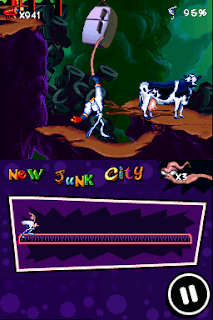 In it you play as an earthworm named Jim (thus the name Earthworm Jim!) who happened upon an alien suit giving him awesome powers. His mission: to save the princess! In the screenshot below you can see that the action is on the top screen while the bottom screen is reserved for stats and to pause the game.. This version of Earthworm Jim for the DSiWare is said to be exactly like the original, so us kiddies are in for a lot of fun!